A Truly Arse-Kicking Cop Movie. 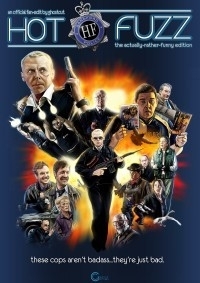 Making HOT FUZZ a leaner, tighter, funnier film. HOT FUZZ was too long. So I felt I should cut it down to a more leaner, somewhat faster-paced and funner film. - Janine (played by Cate Blanchett) is cut. - Angel does not go to Somerfields’ and accuse Simon Skinner of the murders. An extra line from the deleted scenes was added to make it appear that Frank Butterman won’t let Angel accuse Skinner of anything, let alone act on it. Angel just goes back to the hotel. - Extended fence jump scene. - Also cut some unfunny jokes & unnecessary lines. - Some scenes were trimmed. - Credits heavily edited, “Solid Gold Easy Action” song removed. 00:02:53:13 CUT – Most of end credits. Overall good. There were no hard cuts, no flaws to the image or the plot which I did notice, the plot was complete and had a nice flow to it. The edit comes with 3 audio choices and only the third one works on both my PC and my DVD players. Also the background noise and music on the third audio track is noticeably too loud at times. The buttons on the otherwise nice menu are not highlighting for me at all, which means navigating by lucky guess. This for sure is a very nice fanedit and it improves the movie a lot IMO. On the entertainment level I enjoyed the movie this way a lot more than the original (although that one was also quite good), still the ending is for my taste to long to over-the-top. The image quality is perfect. As I mentioned it before, there are 3 audio options, but only the last one (2.0) works on both my DVD players and my PC. Also the audio had a strange problem to it, that the background noise and music were to loud at parts, which made understanding of what was said almost impossible, especially in the beginning. Other than that, all audio transitions worked really well, no flaws there, good work. But I would hope for a version with corrected audio. The DVD comes with a nice animated menu, but the buttons are not highlighting for me, so I have to choose by lucky guess. No artwork is attached. resulting in a 3 of 5 overall rating from me. This is a very good fanedit and definitely a huge improvement over the original, but the audio issues were distracting and the DVD menu does not work. I recommend this to be recreated, still it is an improvement over the original version, can be enjoyed a lot.